Boarding the Casino Cruise ship never felt so extravagant. Win an 8-night deluxe Cruise around the Iberian Peninsula for two! Opt in, deposit and play through an accumulated $50 until 30th April on any game to get a ticket to the prize draw. Promotion Opt-InYou have successfully opted in! - Dine on delectable dry-aged steaks at Chops Grille or tuck into some tantalising temaki at Izumi. - For a real renaissance repast, take on the tastes of Tuscany at Giovanni’s table. - Sit front and centre for 3 original musical theatre productions to ensure the sea-faring show goes on. - And if that doesn’t get your feet moving, maybe a 70s Disco Party, a Latin Fiesta or merengue, bachata and cha-cha classes will. - Tap into your competitive side at the arcade, rouse the kid in you with a little mini golf or put your game face on with Wheel of Fortune-style game show fun! And all of this could be yours. Opt in to start getting tickets towards an unforgettable ocean experience! The promotional period is from 00:00 GMT Monday 11th February until 23:59 GMT Tuesday 30th April 2019. Any gameplay outside this promotional period will not be included in the promotion. Gameplay on any device applies (Mobile, Tablet and Desktop). You will be required to opt in to participate in the promotion. Each player will get one prize draw ticket for every accumulated $50 (or currency equivalent) that is deposited and played through on any game during the promotional period. Only real money will apply for getting prize draw tickets. There is no limit to the number of tickets that a single player can get during the promotional period. 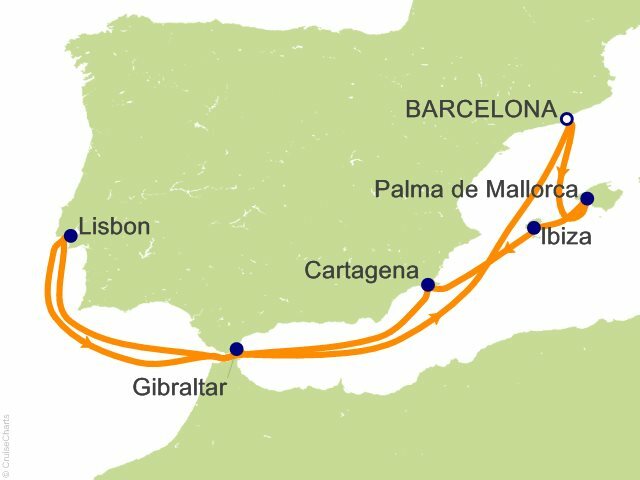 · 8-night Iberian Cruise from Barcelona. · Airfare up to the value of $800. · Onboard entertainment including an arcade, outdoor cinema, dance classes, culinary classes, a 70s disco, as well as a handful of Broadway productions and mini golf. · Use of all fitness/wellness facilities, pools, hot tubs, sports courts, rock climbing wall, sauna, solarium and whirlpools. The cruise package can be exchanged for the cash value of $800. Any exchange rate changes or charges will be deducted from this amount and the remaining funds will be paid directly into the player’s casino account. The winner will be randomly drawn by 23:59 GMT on 08/05/2019. The winner of the prize draw will be randomly drawn and will be contacted via e-mail, phone or SMS. It is the players’ responsibility to ensure they are opted in to receive such communications. Should Casino Cruise be unable to contact the player to confirm their acceptance of the cruise prize package within 72 hours of the promotional period closing, they will randomly select a new winner. It is the responsibility of the winner and his/her travel companion to provide final confirmation with all required details to Casino Cruise within 21 days of being notified that they are the winner, organise their own travel to and from the airport of departure, have valid passports to travel and meet potential visa requirements. The winner and his/her travel companion must be 18 years or older. The winner and his/her travel companion must confirm all the required details a minimum of 28 days prior to the departure date of the cruise prize package. If at any time before a winner receives the prize, their account with Casino Cruise is closed, blocked, or self-excluded from promotional offers, they will no longer be eligible for the prize. If Casino Cruise deems that a participant has acted in bad faith in relation to the promotion, they shall be excluded from the promotion and become ineligible to win the prize. By accepting the cruise prize package, the winner will allow Casino Cruise and any related third parties to use their first name, initial letter of their surname and their location for promotional purposes, without any additional compensation. However, Casino Cruise will always request additional consent prior to publishing. Casino Cruise shall be purchasing prizes from a third party and is therefore not responsible for the quality and condition of the prize and/or its delivery dates to the winner. You therefore expressly waive any claims against Casino Cruise in this regard. The winner is solely responsible for ensuring that they have appropriate insurance prior to travel. Casino Cruise takes no responsibility for injury, sickness, loss or theft of property experienced by the winner during the cruise. In case of any dispute, the English version of these Terms and Conditions are final and binding. These terms and conditions relate to this offer only. However, General Terms and Conditions and Bonus Terms and Conditions at Casino Cruise apply. By participating in this promotion, you confirm your acceptance of all Terms and Conditions.